With the increasingly stringent demands on environmental protection, industries are seeking totally reliable ZERO EMISSION PUMPS. Reliability of pimping operations is of supreme importance in handling critical services. In the case of conventional centrifugal pumps the integrity is always In questions. The mechanical seal has forever been the weak point of these pumps. The pumps are never 100% leak free and require regular maintenance and constant monitoring of the shaft seals, antifriction bearings and the flushing plan systems. The availability and the life of the ump is affected by the vulnerability of these components. It would be worthwhile to eliminate the weak spots in centrifugal pumps to achieve total reliability and leak free pumping. Canned Motor Pumps are indeed the logical solution for safe, zero emission pumping. 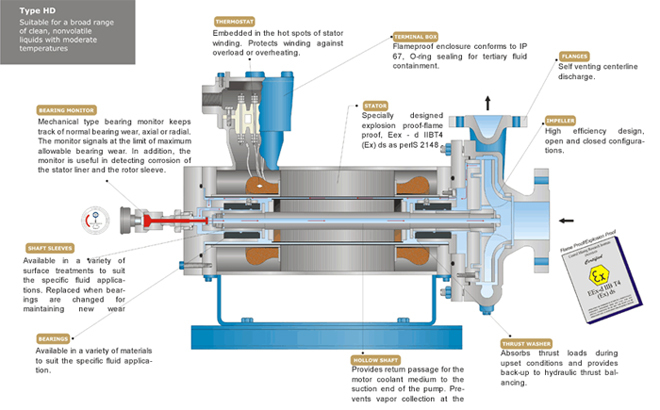 The canned motor pump, originally designed to meet zero leakage and maximum reliability demands of the nuclear power stations, is now widely used in general industry. In particular, they excel in applications involving aggressive. Inflammable, explosive and toxic liquids because of the important advantages they offer over conventional centrifugal pumps. The construction of the Hydrodyne pump is hermetically sealed and provides primary and secondary fluid containment, the process fluid would never need to breach two separate physical barriers before any leakage from the pump/motor unit can occur. Also, as there is no external shaft in a canned motor pump, there is no need for any costly and troublesome on-site shaft alignment, unlike conventionally sealed or long-coupled mag-drive pumps where alignment between the pump shaft and motor seal is required. As the pump and motor are combined in a canned motor pump, the number of wearing parts is reduced, thereby reducing the stock of spare parts required. Type HT high temperature pumps are high temperature pumps suitable up to 400° C. These pumps differ in construction from basic pumps, as pump and motor are separated thermally by an adaptor which prevents heat transfer from the pump to motor area. In these pumps, an independent circulating system using same liquid being pumped with cooling jacket and heat exchanger is provided. The circulation is achieved with the aid of an auxiliary impeller mounted at the fore end of the motor chamber. The cooling arrangement permits the motor and bearings to operate at temperatures much lower than the processed fluid. 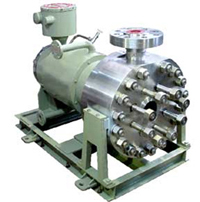 Type HM pumps for liquid with high melting point are high melting pumps for thermosensitive liquids with high solidifying temperature. 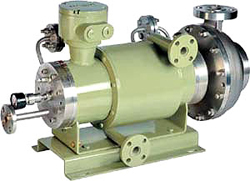 These pumps are provided with a heating jacket on the outer body of the pump and motor to prevent liquid from solidifying during pump operation. Suited for fluids with melting points from ambient upto 150° C.
It is also ideal for services where heating and cooling is required to avoid liquid polymerization / crystallization. Type HR reverse circulation pumps are designed for fluids & chemicals with relatively high vapour pressure, low specific gravity, low specific heat liquids. Liquids with steep vapor pressure curves may vaporize on picking up the motor heat and result in cavitations conditions The circulation/pumping fluid is passed from the casing volute chamber into the rotor chamber through the front bearing housing. After being extracted from the outlet of rear bearing housing, the liquid is returned to vapor zone in the suction tank, through the reverse circulation line. 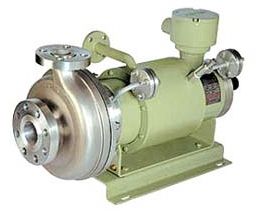 Type HS heavy duty slurry pumps are designed for slurry services. Clean liquid compatible to system liquid is flushed through the inlet port at the back of the motor to prevent the ingress of slurry into the motor area with back flushing line arrangement. The function of this arrangement is to prevent the slurry entering into the rotor chamber. This also lubricates the bearings. 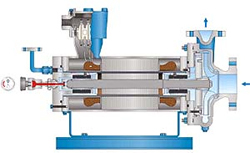 An auxiliary impeller located at fore end of the rotor circulates the flushing fluid through an integral heat exchanger to minimize frictional and electrical loss. The back flushing arrangement enables the pump to operate in process fluids with solid continent up to 5%.The back flush should be started at least one minute before switching on the pump and should be allowed to continue for a minute after shutting down the pump. Hydrodyne offer specially designed vertical high pressure pumps for very high working pressures up to 450 bars. The pressure bearing parts are designed and manufactured as per AS ME section (iii) standard code. Type HTHP High Temperature High Pressure Pumps also exhibit all the features and benefits of the standard canned motor pumps. Conventional Centrifugal Pumps with Double Mechanical Seals. Separate motor and coupling required. These are susceptible to environmental deterioration. Double mechanical seals wear out and call for replacement time to time. Seals and buffer fluid systems to be monitored continuously. Periodical maintenance and downtime are unavoidable. Coupling misalignment may lead to seal and bearing failures. No provision for secondary containment in case of fluid leakage. Leakages can prove expensive, hazardous or catastrophic. Multiple bearings and gaskets cause frequent maintenance. Separate motor and coupling susceptible to environmental deterioration. Coupling misalignment may lead to total system failure. No secondary leak containment. Leakages into atmosphere cannot be avoided on pump failure. Single containment shell vulnerable to rubbing and gall through both internal and external magnets. When containment shell ruptures outer magnet can be flung away. Magnet slip can cause severe vibration and mechanical damage on every part. The pumps have pressure limitations. No arrangement for detection of bearing wear. Large base plate and rigid foundation required. Large, heavy base plate and rigid foundation required to dampen vibrations which may cause seal and bearing failure. Large space requirement to accommodate pump and the auxiliary system, piping etc. For field repair, almost all the pump parts including the driven magnet must be kept in stock. The magnet may be demagnetized while in warehouse. Virtually impossible to disassemble and/or reassemble the drive and driven magnets at site, or even in a plant repair shop. Special tools and skills are needed for maintenance. Strong magnetic field influence other instruments nearby either at installation site or in the ware house. Zero Emission : Handles toxic, explosive, expensive, hazardous, Cryogenic and corrosive fluids without any possibility of emissions into the environment. Compact Design : Motor and pump form a single unit. No alignment, hot or cold, no grouting or elaborate foundation is needed. Canned Motor pumps need only 1/3 the space required for the same model of conventional pump. Vaccumtight : Ideal for vacuum services or for fluids that react to contact with the atmosphere. Quiet Operation : Low noise level since no fan is used to cool the motor. All rotating parts are contained within a thick shell that further dampens noise. No Dynamic Shaft Seal : No mechanical seal or gland packing. No leak path. Significantly reduced number of parts. No External Lubrication : Pumped fluid provides cooling and lubrication of motor and bearings. No lubrication levels to check or maintain. Field Repairable : All wear parts are easily changed and enhanced with back pullout design. Explosion Proof : All canned motors are provided special protection and flameproof enclosure in accordance with VDE 0530 and 0171, Encl. (Ex) ds 3n G5-G1. All Hydrodyne canned pump motors are flameproof/explosion proof, CMRI certified EEx-d IIB T4 (Ex) ds. All Pumps Performance Tested : Very component of each pump is manufactured by Hydrodyne adhering to strict statistical quality control tolerances. Every Hydrodyne adhering to strict statistical quality control tolerances. Every Hydrodyne pump and motor are 100% performance-tested before shipment with special testing capabilities available to all customers. 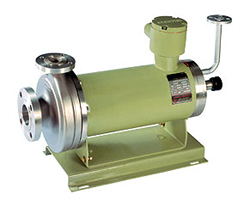 In the canned Motor Pump, the motor is cooled by the pumped fluid itself. Therefore suitable insulation class depending on the temperature of the liquid handled is chosen. Occasionally the motor winding temperature may exceed limits particularly due to some malfunction of the cooling system. As a precaution from damage of the motor a thermostat is embedded in the hot spot of the winding to protect the motor from over heating. Thermostat is usually of th closed contact type which will open out at the precautionary preset temperature causing the motor protection circuit to trip off the motor. Thermostats are installed with the motor of Canned Motor Pump, as a standard feature. Thermowells /thermocouples are installed in the construction for measurement of fluid temperature. This enables switching of the pump assembly if the temperature crosses acceptable limits, preventing excessive damage to the pump. Unforeseen closure of suction and discharge valve. Suction flow affected by vapour lock and available NPSH at any point of time. Inducers are axial Impellers, which are installed closely in front of the first impellers of a Centrifugal Pump on the same shaft. The inducers cause an additional static pressure in front of the impeller. 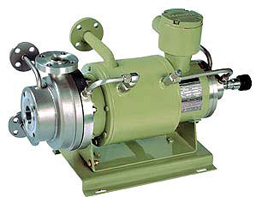 They are particularly used where the NPSHA is not sufficient, in order to reduce the NPSHR value of the pump.